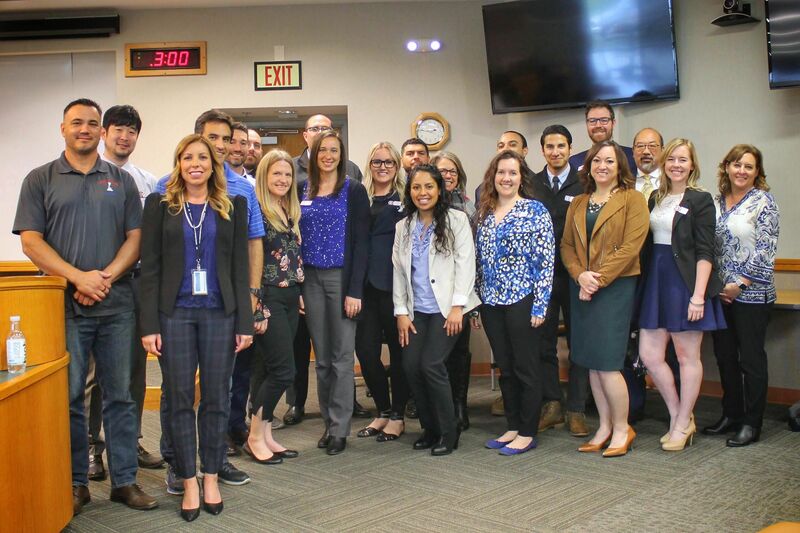 “Hello Human Kindness” is the slogan of Dignity Health, one of the stops during Leadership Santa Maria Valley’s Health & Human Services Topic Day, which took place January 11th, 2019. It was also the theme of the day, as the class met with leaders and organizations focused on bettering the physical and mental health of our community, and had a true passion for the people they serve. The class began their day at VTC Enterprises, an organization that provides job opportunities to adults with disabilities. The class enjoyed breakfast prepared by VTC’s A Street Café, which is open to the public for breakfast and lunch on a daily basis and one of the many employment opportunities VTC provides to the people they serve. The class heard from VTC Development Associate, Erika Weber on exactly what VTC has to offer, and the class was impressed by just how much VTC does for adults with disabilities in our community. Clientele at VTC ranges from those who struggle to preform basic functions, to those with disabilities undistinguishable to the average person. In addition to the services VTC offers at their campus, they also contract with local businesses to provide employment opportunities to the adults they serve. 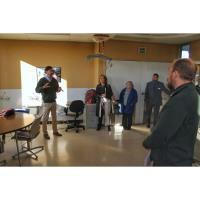 VTC CEO, Jason Telander joined Erika to take the class on a tour of the VTC facility. Throughout the tour, the class saw just a few of the many opportunities VTC offers, including an onsite print shop and thrift store run by their clients. Next, the class visited Marian Regional Medical Center, where Dignity Health Regional Vice President, Chuck Cova gave a leadership presentation. Cova sparked interest among the class with his leadership philosophy on being present and checking in daily with your team in person. With digital communication on the rise, the class was surprised that Cova prefers face to face communication or picking up the phone, rather than a text or email. President and CEO of Marian Regional Medical Center Sue Anderson also spoke, touching on how Cova’s success as a leader has stemmed from his humbleness and ability to connect with others on a personal level. The presentation was followed by a tour of the facility with Candice Monge, where the group got a sneak peek at the new pediatric emergency room wing specifically designed to accommodate children needing emergency medical attention. The class was impressed by both the amount of services and level of care Marian provides our community. The topic day finished at the Betteravia Government Center, where the class spoke with a panel of health and human service organizations in our community. Panelists included Amy Lopez with Santa Barbara County Department of Mental Health, Steven Baird with Band of Brothers/ECHO Group and Aaron Pankratz with CASA. While each organization touched on various wellness issues in the community, they were united in their passion for helping others and showing kindness and compassion to the people they serve. The group ended the day with a wellness discussion and 10 minute meditation session with Eleanor Byars, Santa Maria Valley YMCA’s Aquatics Director. Eleanor leads a ‘Mindful Meditation’ class at the Y each week. Even just 10 minutes a day of meditating can assist in relieving stress that comes with the day to day of life. 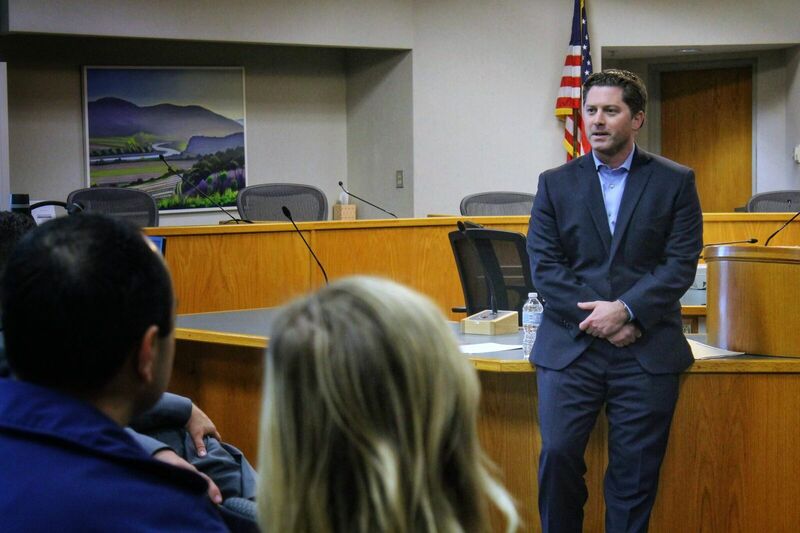 Finally, the class received a surprise visit from State Assemblyman Jordan Cunningham, who talked to the class about the issues he sees facing our community and how he is advocating for our community in the State Assembly. Cunningham also talked about his experience in politics and leadership qualities that have helped him on his journey. Across industries and organizations, the leadership class saw the theme of being compassionate for others and having passion for what you do as a critical part of being a leader. Leadership Santa Maria Valley would like to give a special thank you to the Santa Maria Valley Chamber of Commerce, who sponsored breakfast, and Dignity Health, who sponsored lunch. Also, as special thank you to all the speakers and organizers who helped make the day a success.